Today, I visited the one-day conference “DOAG SIG Java”. The main subject was the Java Enterprise Edition 6 (JEE 6). “DOAG SIG Java” – What’s that? 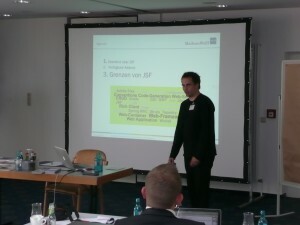 The DOAG is a very large, german, independent Oracle-Usergroup. After the acqisition of Sun, the SIG Java was established to demarcate the Java technology from other business units (database, administration, …). Conferences are organized several times a year, the number of participants varies from 50 to 2000. The conference was very interesting. Besides me, speaker from Oracle, Msg Systems and IMIXS were on site. Also Adam Bien, a well-known JEE expert, author and speaker (also involved in the JEE specs) was present. 2) Usage of Components in JEE + Discussion: Why is there no JEE Marketplace (just like the Apple App Store)? – Is the business logic too specific for a company / for a project? – Who wants to build components for Oracle, IBM and so on? – Who guarantees for the quality and who gives support? – Probably developers would use available components, but who should build them? Code examples showed the new features of the API, meta model, Queries (such as the new Criteria API). – Limits of JSF: When should you use another web-framework? First a categorization of web frameworks was presented to show why developers sometimes should think about using web frameworks such as Grails (CRUD), GWT (Rich Client) or JavaFX (Rich Internet Application) instead of JSF in some use cases. I wrote down a lot of very interessting statements of Adam Bien’s excessive experiences with Java technologies. You can read them discussed in my other blog entry including my comments: 10 interesting Statements of Adam Bien about the Java Enterprise Edition (JEE) 6. A nice one-day conference about JEE 6. The participants got an overview about JEE 6, its new features, practical experiences and interesting discussions…. This entry was posted	on Thursday, September 9th, 2010 at 21:33	and is filed under Application Server, ESB, IT Conferences, Java / JEE. You can follow any responses to this entry through the RSS 2.0 feed. You can leave a response, or trackback from your own site. Powered by WordPress v 5.1.1. Page in 0.215 seconds.